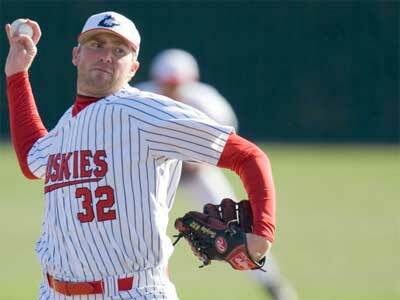 Northern Illinois closed day one of the Brooks Wallace Memorial Tournament 0-2, falling to No. 18 St. John’s 11-9 in 10 innings and 8-5 against Texas Tech. The Huskies were without several key players who fell ill earlier in the trip. Forty-five minutes after the Huskies 10-inning 11-9 heartbreaker against the Red Storm, NIU bounced back to play Texas Tech and found itself in a 7-0 hole after four innings. After a series of hits, walks and errors in the top of the fifth, the Huskies broke the seal as Jamison Wells (Combined Locks, Wis./Kimberly) singled and drove NIU’s first run, 7-1. The Huskies took advantage of TTU in the top of the sixth inning and scored four runs on two hits, two sacrifices, one walk, a balk and one error to close the gap, 7-5, in favor of the Red Raiders. Texas Tech added one run in the bottom of the eighth to increase the lead 8-5. NIU flirted with another last-inning rally as the Red Raiders walked leadoff batters Joe Battaglia (Westchester, Ill./St. Joseph’s) and Jordan Rishavy (Rochester, Minn./North Iowa Area CC). A wild pitch advanced Richavy to second, but Battaglia was caught stealing at third base by the catcher. Huskies Wells and Alex Beckmann (Batavia, Ill.) were unable to extend the rally and Northern Illinois would fall 8-5 in game one of the series with Texas Tech and to 0-5 this season. The NIU pitching staff combined for 10 strikeouts, including six from Jake Hermsen (New London, Wis.) in four innings of work. The Huskies bullpen, made up of Jacob Goldenberg (Syracuse, Ind./Wabash Valley CC), Zach Badgley (McHenry, Ill.) and Ben Etcheverry (Winter Haven, Fla./Lake Region), combined for four innings on the hill and only allowed three hits, three walks and one run. Wells extended his hitting streak to 19-games and sits by himself outright at No. 3 all-time in the NIU annals. He is one game shy of Dave Reynolds’ (2007-10) 20-game hitting streak, recorded in 2009. For more information on NIU baseball and Huskie athletics, visit www.niuhuskies.com.